Our new Annual Report is out and we’re excited to share it with you. It’s got a new modern look, a colorful design, and it’s filled with plenty of information in an easy-to-read format to keep you up to date on the organization’s big activities and casework in 2017. Last year was a year of big changes for CUB. I joined the organization as executive director and we hired our utility analyst, Corey Singletary, from the Public Service Commission. This year, we added Kate Hanson our staff attorney. Joining the new folks at CUB is longtime outreach and communications manager Richard Storck. The report includes the first look at new membership badges that we’re sending out to members and anyone who joins CUB. 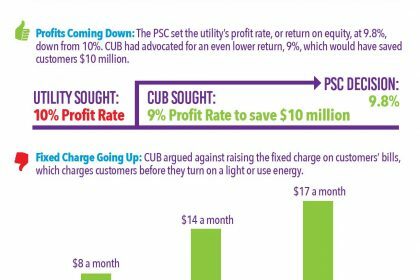 Joining CUB isn’t expensive and costs $35 for a full year. We’ve shifted to a new business model that enables us to get more active in more cases at the PSC, and the report talks about how we’re looking to expand the ranks of our small business members. Find out more about what CUB’s been up to by checking out the annual report. You can scroll through it, or download it, right on our website, cubwi.org. 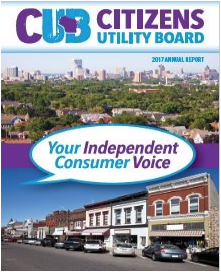 And be sure to send feedback about the report to me at content@cubwi.org.